Your Fantasy Football lineup is complete, beers are cooling in the fridge, and you’re sporting your chosen team’s jersey. It can only mean one thing – football season is in full force! But, this year, you have decided to kick up your game celebrations a notch. Your home theater is all decked out in Seatcraft Home Theater Seating, your flat screen is mounted and ready for your viewing pleasure, but what is missing? Only the most important factor to any party -the food and the beer! Your friends are already on their way over so don’t fumble on game day! This is where we come in; we have the best of the best when it comes to new recipes to wow your friends as well as the best beers to pair with your eats. Head for the end zone and make it a party your pals won’t forget! 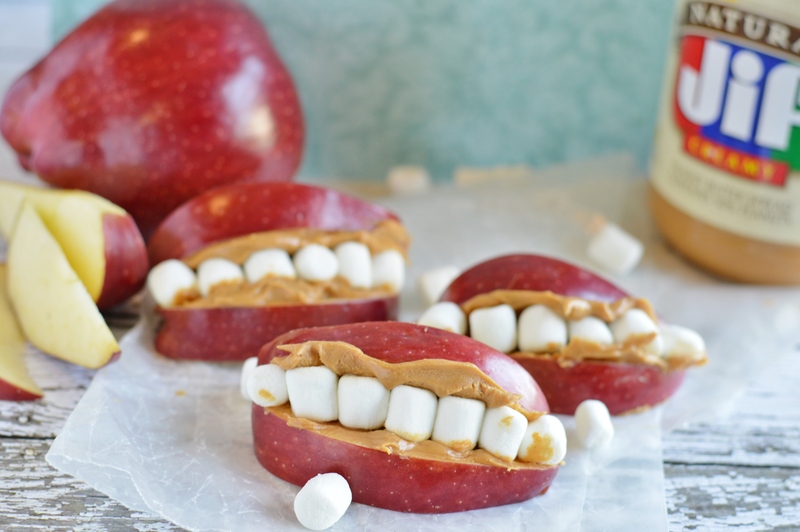 Oh yes, the classic snack that brings all of our favorite flavors together. You have meaty, cheesy, salty, and sometimes spicy flavors come together to create a sensational party inside of your mouth. Everyone knows that beer is amazing with nachos, but what kind is the best pairing? Since we do have all of these flavors coming together inside the dish, you will want a beer that is a bit sweet, but contains enough body to work with all the salt you’re consuming. Amber Ale would be the best counterpart to nachos, more specifically El Rojo Amber Ale, or Flat Tire Amber Ale. 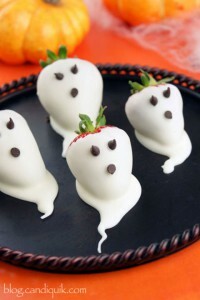 They will give you enough contrast to make you fall in love with the amazing flavor. Want to take your nachos to the next level? 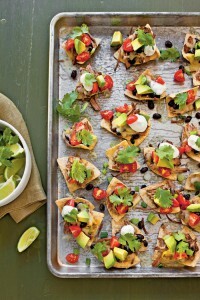 Try this recipe for Slow Cooker Beef Nachos! You’ll thank us later. 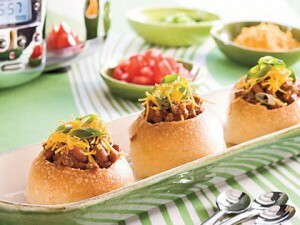 The perfect meaty dish has become essential for any football party. It’s savory, sometimes spicy, smoky, and just brings the comfort of home into your stomach. So, what beer can possibly be good enough to keep up with these amazing flavors? In order to pair with chili, the beer needs to be rich, malty, and smoky. It will supply you with as much warmth as you would desire from a drink. The best selection for you would either be Bloktoberfest from Atwater Brewing, or Sam Adam’s Boston Lager. Salivating yet? To upgrade your typical chili, try this recipe for Super Quick Chili! Not only is it quick and easy, it is also delicious. 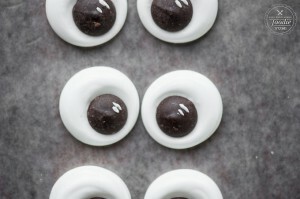 How could you not have this quintessential game day food? You can have it any way you desire, but we all know that if it’s spicy, it’s better. Instead of grabbing a glass of water for relief from the spice, grab a cold one! Your beer of choice has to have the proper flavor and composition to complement the spice within the wings, or else your mouth will be perpetually on fire. We recommend a beer that is nice and refreshing, like American Pale Ale, or Bass Pale Ale. More likely than not, any sort of Pale Ale will be the perfect choice. 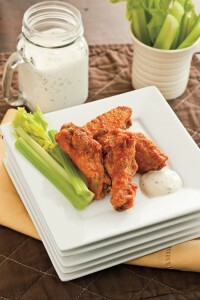 Now, you just need to wow your guests with the recipe for Angela’s Spice Buffalo Wings! 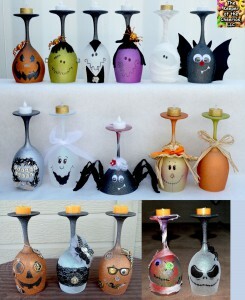 They are sure to “turn up the heat” for any party. If it has bread, cheese, and sauce, then it’s perfect for football. Pizza and beer have gone together like peanut butter and jelly for an unthinkable number of years, but have you been choosing the proper beer for your food, or just a kind you think would be good? We’ll let you in on a little secret: you want to look for a beer with IPA next to it. That’s right, Indian Pale Ale goes perfectly with pizza! The best brands would be Dogfish Head 60 Minute IPA, or North Peak Diabolical IPA. Ideally, if it has hops and a hint of caramel sweetness, it will enhance your pizza’s flavor and make the meal complete. 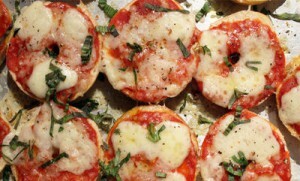 Peel yourself away from the typical delivery or frozen pizza and try making your own with this recipe for Pizza Bagel Bites! They’re bite-sized, fresh, and taste so much better than any other pizza you’ve had. 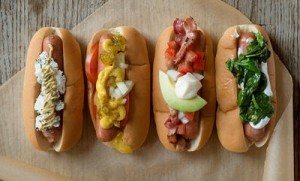 Chances are, you’ve eaten more hot dogs while watching sports than at any other event in your life. Who could blame you? They’re one of America’s classics! However, it’s also difficult to find the perfect beer to pair with it without the drink being overpowered by the hot dog’s strong flavors. Ideally, you want to find a beer that has rich, malt flavors, some spice, and a hint of fruity flavors. It may sound like a strange combination, but it is wonderful! A strong contender would be Bell’s Best Brown Ale, but we love Belgian-Style Dubbel the best. We know you know how to work a grill to cook up some amazing hot dogs, but maybe you would like some tips on how to upgrade them with this guide. Go wild with your flavors! 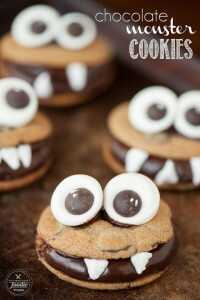 Most people don’t put dessert into consideration when planning their football party, but we demand it! There needs to be some sweetness in the menu, or else your guests will fall into a meat-and-carb-loaded coma. When you do decide on the perfect dessert to end the night with, you have to consider your beer pairing too! If you didn’t know already, beer actually tastes amazing when paired with chocolate. When choosing your beer, it is best to go with a Dry or Irish Stout. The bitterness in the beer with contrast with the dessert’s sweetness, and the stout will cleanse your palate for the next bite. 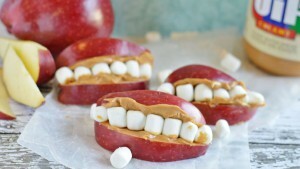 It lets you have the perfect first bite, each bite. We select Left Hand Brewing Co. Milk Stout Nitro as our dessert beer of choice. It tastes great! 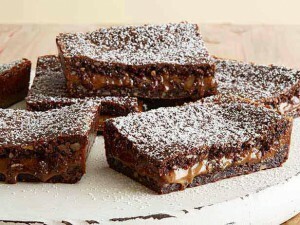 If you need ideas for an amazing dessert to serve, try Ree’s Knock You Naked Brownies! It will be a recipe you make over and over again! Now that you have the amazing food and their ideal beer pairings, it’s time to huddle and get the party started! 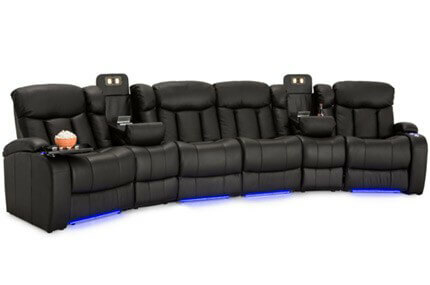 If you still need to upgrade your home theater, check out 4seating.com and the fantastic selections on home theater seating. We recommend checking out Seatcraft Multimedia Sofas, especially ones with refreshment consoles to keep your beers cold, and trays to place your food upon. They will make your season fun, comfortable, and organized. Enjoy your new and improved football season! This entry was posted in Blog on October 26, 2017 by seatcraft. Looking for ideas of fun things to do with your family? Well you’re going to want to sit down for this one – and so will they! Find the perfect seating configuration for your family’s home theater and let the good times (and movies) roll. Want to treat your family to dinner and a movie? Make it possible with the Seatcraft Niagara sectional. Not only does this sectional come with complimentary tray tables, it has lighted cup holders to keep the spills at bay. Can’t hold all your snacks at once? No problem! This sectional also has hidden in-arm storage for all your tasty treats and other essential items. Did we mention the power recline switches are equipped with dual USB ports, eliminating any bickering about who gets to sit next to the nearest power outlet? Yes, please! 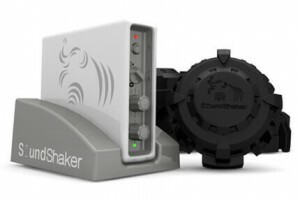 Hoping to upgrade your family’s theater home experience? 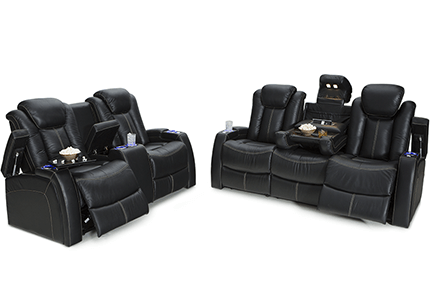 The Seatcraft Republic Home Theater Sectional is a combination of two best-selling configurations. 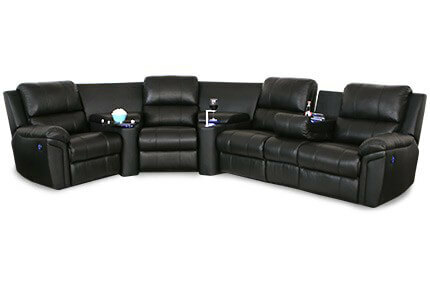 This sectional has power adjustable headrests and power recline. It also comes with an armless chair that folds down to reveal a beautiful burlwood table embedded directly into the sectional. For more storage, the armrest lift up to provide space for trays, tablets, reading materials, and more. 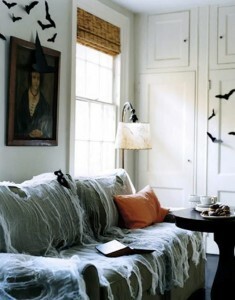 Interested in something on the cozier side? 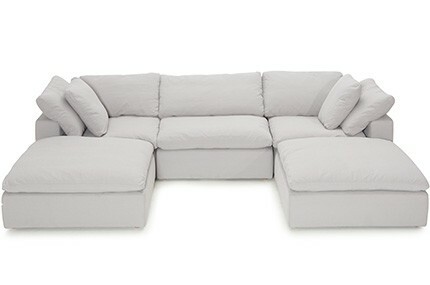 The Seatcraft Heavenly Modular Sofa is simple yet comfortable and adaptable to any room setup. Whether you are looking to pair it with theater seats or let it stand on its own, this sectional can warm up any room with its cloud-like seating and neutral colors. Before selecting your sectional, take a moment to decide how you would like to set up the seating configuration in your home theater or living room. Are you looking for an L shape or a straight design? How many consoles does your family need? 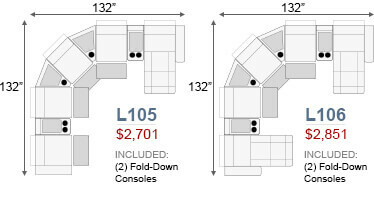 All of these sectionals can be arranged in a unique shape to fit your unique family. Here are some particularly adaptable styles that could work well for you. Dress any room up with the grandiose Seatcraft Genesis Sectional. The most notable items about this sectional are its storage wedges, which allow for a variety of configurations. The storage wedges come in two designs: straight with two cupholders or triangular with cupholders and storage space. 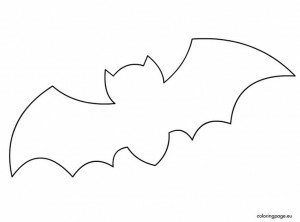 Make the shape your own or follow these suggestions! If you are searching for a more classic feel, the Seatcraft Madison Leather Gel Sectional is a traditional style sectional with all the modern day necessities your family desires. 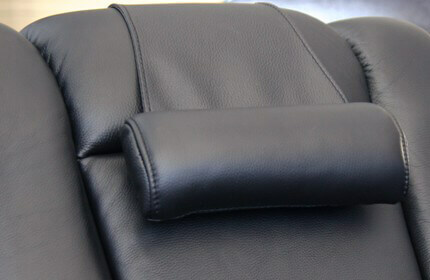 It comes in black or brown, and sports chaise-lounger footrests for maximum comfort. Interested in learning more about the leather gel style? Request a free material sample to see if this sectional may be right for you. Once you’ve selected the sectional with the best fit for you, dress it up! Accessorize your sectional with add-ons that are tailored to your family’s needs. Neck problems? The universal neck pillow adapts to any seat and provides great head and neck support. Is someone in the family a bookworm? 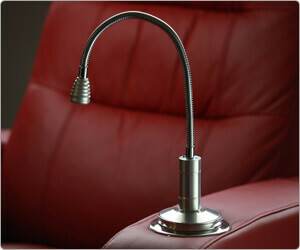 Make reading easier for them with the articulating LED light upgrade. This light is designed to be discreet and non-intrusive to neighbors sitting on either side. Enjoy your movie and while the person beside you devours their book! Need a refreshment? 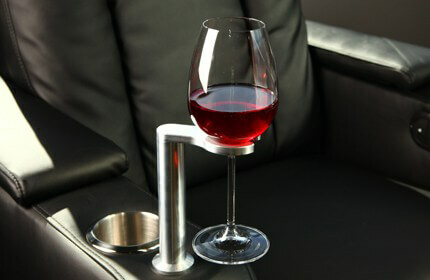 There’s a wine glass caddy for the wine enthusiasts in your family. This caddy is designed to avoid spillage and looks great with its stainless steel finish. Pair it with any size glass. After all, the more the merrier! These large room seating configurations are enough to convince any family member to be a homebody for a night (or ten)! Once you’ve selected the right look for you, it’s only a matter of configuring out how you want to set your room up! For any other questions or lay-out options, feel free to contact a Seatcraft customer support representative from 4seating.com. This entry was posted in Home Theater on October 3, 2017 by seatcraft.